The IDEAS ASIC development team congratulates the ISS-CREAM collaboration to the successful launch and installation of their instrument on the international space station! The Cosmic Ray Energetics And Mass experiment for the International Space Station (ISS-CREAM) was launched on board a SpaceX Falcon 9 on August 14th, 2017, installed on the Japanese Experiment Module (JEM) and powered up on August 22nd, 2017. The ISS-CREAM collaboration, led by Professor Eun-Suk Seo of the University of Maryland, will characterize the highest-energy cosmic particles ever measured systematically by an instrument in space. 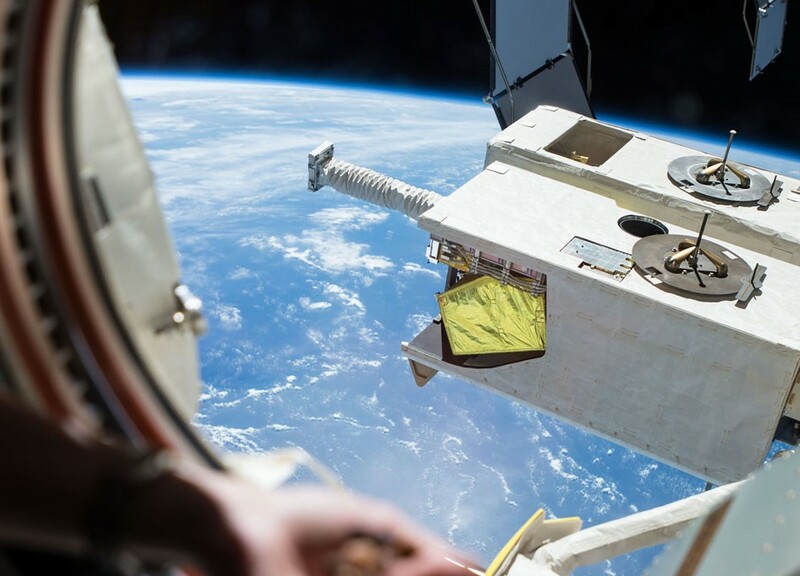 Photograph from the International Space Station showing the instrument installed on the Japanese Experiment Module- Exposed Facility, JEM, Image: NASA. ISS-CREAM detects cosmic particles and measures their electric charge. ISS-CREAM comprises a silicon charge detector for identifying incident cosmic rays, a carbon target, a sampling tungsten/scintillator calorimeter for the energy measurement of all nuclei, a segmented top and bottom counting detectors for the electron/proton separation, and a boronated scintillator detector for additional electron/proton separation and detecting neutron signals. The top and bottom counting detectors comprise a plastic scintillator and a 20 by 20 silicon photodiode array [REF1]. IDEAS has designed and supplied the integrated circuits for the readout of the photodiode arrays. The integrated circuits detect and amplify the electric charge from the sensors before the signals are digitized and processed into scientific data. ISS-CREAM was originally developed as a part of NASA’s Balloon Program, during which it returned measurements obtained in the stratosphere at around 40 km altitude in seven flights between 2004 and 2016. [REF1] H.J.Hyun et al. “Performances of photodiode detectors for top and bottom counting detectors of ISS-CREAM experiment” , Nucl. Instr. Meth. A 787 (2015) 134-139.